Root rot and decline from lack of oxygen to the root system are major threats following floods. Perform a triage, separating seemingly healthy plants from those that are already showing signs or symptoms of flood-related damage. After the water recedes, inspect the roots (perhaps 5% of each block). Many plants listed in Table 1 as having “Poor” tolerance to flooding might have brown roots already. If many or all of the roots are brown, discard plants, as they either will not recover, or, if they happen to regrow, there may be too much infected tissue to make the cost of treating them worthwhile. The pesticide application expense and production time it takes for the crop to recover might be the same time or longer as potting new, healthy liners and growing them to a saleable size. Plants marked “Good” may not present brown roots or above ground symptoms for several days, so check back in a week or two to see if roots are decayed and if any foliar symptoms like chlorotic foliage or wilting occur. In more advanced stages, above ground symptoms may include stunting of terminal growth, shortening of internodes and interveinal chlorosis. These plants are not likely to recover and, if they do, may need another season of growth or at least a new flush of growth before sale. Monitor them for the plant diseases outlined below in sub-heading Pathogens. Table 1 below contains plants designated as either “Good” or “Poor” flooding tolerance. These rankings are based primarily on information from landscape plantings flooded for more than 5 days and some as long as 30 consecutive days. Unlike container grown plants, these plants had established root systems in soil and were not without water when the floods receded. Additionally, their foliage was also not underwater. Thus, container-grown plants may experience additional stresses and may respond differently. Also keep in mind that the time of year a plant is flooded has a substantial impact on its survival. 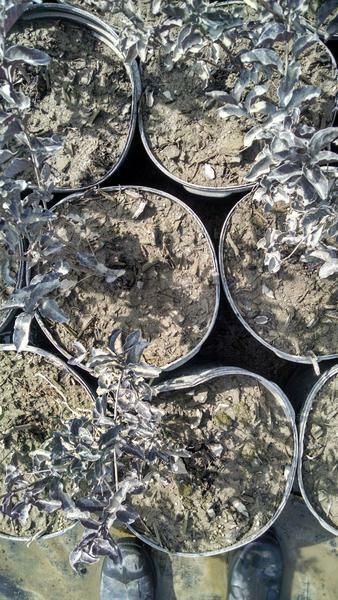 Dormant plants can survive flooding conditions longer than actively growing plants during very warm temperatures. Use the table and above triage process as a guide to determine whether to keep plants, monitor plants closely, or discard plants altogether. Data are compiled from the following four websites and publications, but we have modified the rankings to either “Good” or “Poor” survivability. Hunches in Table 1 are based on discussions with Dr. Todd Lasseigne (Tulsa Botanic Garden), Dr. Tom Ranney (NC State), Dr. Jim Owen (Virginia Tech), Danny Lauderdale (NC State), and Dr. Anthony LeBude (NC State). This is an area for future study and observance over the next several months to see which plants recover. Table 1. List of plants that are assumed to have either good (G) or poor (P) tolerance to several days of flooding in containers. Hunch (H) represents survival estimated based on experience and knowledge of the plant’s root systems. A designation of G? and H means plants may or may not come back, but their value is to high to not save them. Red hollies, Oakland, Oakleaf, etc. Figure 1. 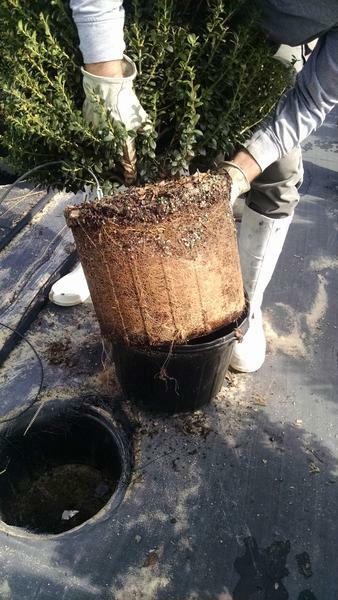 Removing root balls from containers to inspect roots for damage. Figure 2. Brown roots already dead from flooding after 36 hours of inundation. Figure 3. 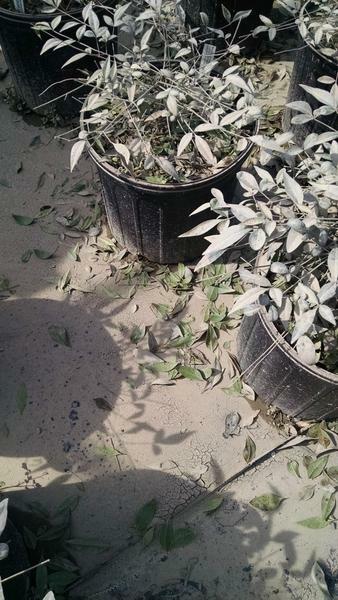 Defoliation of Nandina domestica after total immersion from flooding for 36 hours. Figure 4. Marginal necrosis of foliage of Prunus spp. after flooding of just the containers for 48 hours. Figure 5. Death of leaves and stems on new growth of Ligustrum spp. after total immersion for 48 hours. Figure 6. 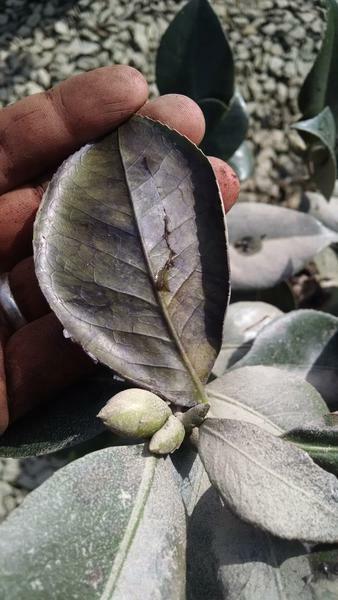 Blackened tissue underneath leaves of Camellia japonica after 36 hours of total immersion. Containerized plants that were flooded with water containing silt or fine particles may result in a thin layer of accumulation on the top of each substrate in the plant (Figure 6). Because particles are fine, they might inhibit water penetration from irrigation and actually decrease the volume of water that reaches the roots. Simply remove the layer by hand, which also might remove any weed seeds contained in the flood waters, thus preventing potential weed problems later. Additionally, decreased substrate air space and increased water holding capacity may occur if the silt particles infitrate down into porous subtrates. Therefore, reevaluate irrigation scheduling to ensure that plants are not overwatered and that ample air is available to the plant roots to minimize potential root diseases. Figure 6. 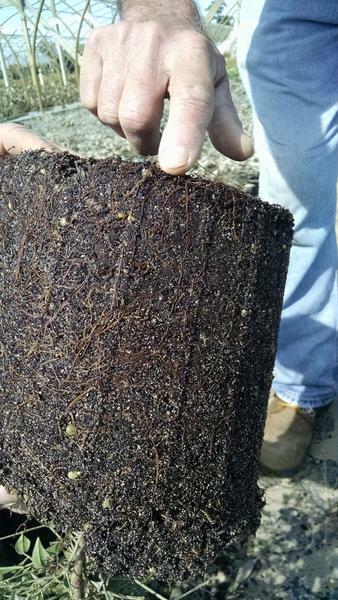 Silt accumulated on top of container substrate after flooding. Plants with controlled release fertilizer (CRF) incorporated into the container should be fine even though plants were flooded for several days. This is also true of plants potted up in late summer especially if a longer term CRF (more than 3-4 month release pattern) was used. Plants that were topdressed with CRF might have lost any remaining prills on top of the container substrate. Generally prills of CRF in containers whether on top or incorporated at this time of year have very little CRF available, so letting plants simply go dormant after recovery might be a better option than reapplying lost nutrients. Plants with dead root tips might not be able to absorb nutrients either, so a recovery period is necessary for new roots to develop. Monitor plants after recovery making sure not to overwater. Conduct pour-throughs if possible after a few weeks to determine nutrient availability. Determine which plants, depending on sale date in spring, might need more nutrients. Fertilizing a full rate in fall, this close to the first frost might stimulate growth and cause further damage. Additionally, if plants have compromised root systems, they may be more susceptible to salt damage. Fertilizing with a low to medium soluble fertilizer could be a good option to improve nutrition levels before winter without supplying sustained levels of nutrients that could inadvertently stimulate growth. Monitor plants after recovery, making sure not to overwater or under water. Because roots systems are comprised, the plants will be dependent on the few healthy roots remaining to supply all water. Therefore, once the plants have dried to the point of needing irrigated again, short, frequent irrigation events are better than infrequent, heavy irrigation events, although take into consideration weather and plant demand for water. Flooding can remove residual herbicides and bring in new weeds. When soil erodes, residual herbicides move with the soil; therefore, in highly eroded situations one can assume the residual herbicide is all but gone. Where soil erosion did not occur herbicides can leach, wash in surface waters, or decompose rapidly. The only ways to know if the herbicide has dissipated is to wait and watch for weed emergence or to conduct a bioassay. More detailed information is available in the factsheet: After the Flood – Weed Management for Nurseries and Landscapes. Stem borers pose significant risk to recently flooded trees since granulate ambrosia beeltes are attracted to the ethanol that is produced by trees as a stress response to flooding. Fortunately, as of this time (October 2016), ambrosia beetles are done flying until spring 2017. It is difficult to say if trees flooded now will be more vulnerable in Spring 2017. For instance, if the roots are not severely impacted and do not succumb to a disease, such as Phytophthora, then they should be ok next spring. But, if flood stress this fall impacts various physiological processes. for instance disrupts dormancy and leads to winter injury or causes disease issues or impaired root function, then it could indeed result in trees being vulnerable to attack in the spring. Dr. Chris Ranger, Research Entomologist, USDA-Agricultural Research Service, Wooster, Ohio, has conducted short-term time course analyses of ethanol emissions on trees in spring. Ethanol is induced in dogwoods and redbuds within 1 day of initiating flooding, peaks around 7-10 days, and usually begins to drop off around 20 days. However, there is a surprising amount of intraspecific variability in stress induced ethanol emissions. He thinks it would be useful to monitor trees that are known to be intolerant of flooding during this fall, winter, and early spring before beetles start flying to see if any unusual symptomology appears. Dr. Christopher T. Werle, Biological Science Technician, USDA-ARS, Poplarville, MS, mentioned that stressed forest trees in the surrounding habitat may allow for a greater population of beetles around the nurseries due their own stresses experienced, and therefore there might be more attacks even further out from next spring, but that is just speculation. In either case, trap for beetles on nursery for the next three years or follow the guidelines below to become aware of when they merge in your area. At this time it is not necessary to apply a nursery wide preventative spray of permethrin (or similar pesticide) to prevent borers from attacking trees this fall. In general, borers are not active in the fall and insecticide applications will not remain effective through the spring when flight begins again. Therefore, monitor traps and wait until borers emerge in spring before beginning a spray program. Additionally, follow Steve Frank on twitter (@ornapests) to learn when beetles emerge in spring 2017. Trapping at your location is the best way to know when insects are active. For nurseries spread over different properties or very large nurseries, deploying several traps can help identify “hot spots” and prioritize pesticide applications. Begin trapping for beetles at your nursery by using this guide: Granulate [Asian] Ambrosia Beetle Trapping. Other borers, for example clear-winged borers, are known to attack stressed trees up to 1-2 years after the stress has occurred. Follow this link to learn their life cycle and methods to scout and monitor for them: Peachtree Borer in the Landscape. Maintaining a current spray program next spring when those borers emerge would be ideal. Flatheaded appletree borers emerge later in spring and also attack previously stressed trees especially if some sort of wound is present. Trees may already be infested with borers from earlier this spring, so scouting is important. Their life cycle is here: Wood Boring Beetles in Trees. Use this wonderful master-work for a comprehensive understanding of modes of action, rotating pesticides, trade names, and the insects and pests they control in the nursery and landscape. It is a beautiful contribution from the Universities of Tennessee and Clemson. A wide range of fungi incite canker diseases in both hardwood and conifer hosts by invading the bark, cambium, and outer sapwood of branches and stems weakened by mechanical injuries, insect feeding, water extremes, or other diseases. Branches and main trunks of trees submerged in flood waters or injured by floating debris will be prime targets for invasion by canker fungi. Some of the most common canker diseases include Nectria, Cytospora, Botryosphaeria, and Botryodiplodia. Cankers appear as localized dead areas on branches or stems and are commonly associated with wounds or dead branch stubs. They often appear discolored or sunken, and the bark may or may not remain attached to the face of the canker. Some canker diseases such as Nectria produce zonate or target-like cankers in response to successive layers of callus tissue forming at the progressing edge of the canker. Cankers can girdle branches or small stems and result in wilting or dieback. Canker diseases are rarely fatal to their hosts unless large or multiple cankers girdle the main stem. Because wounding and predisposition play a role in the development of canker diseases, the best approach to management is to minimize tree stress and injuries. Species of Phytophthora and Pythium, commonly known as water-mold fungi, are ideally suited for waterlogged soil conditions. Plant roots stressed by reduced oxygen in waterlogged soils exude more amino acids and ethanol, which attract infective, swimming spores (zoospores) to root surfaces. Zoospores are dispersed in surface water such as flood, runoff and irrigation waters and therefore; an increase in root and collar rot diseases caused by species of Phytophthora and Pythium can be expected. 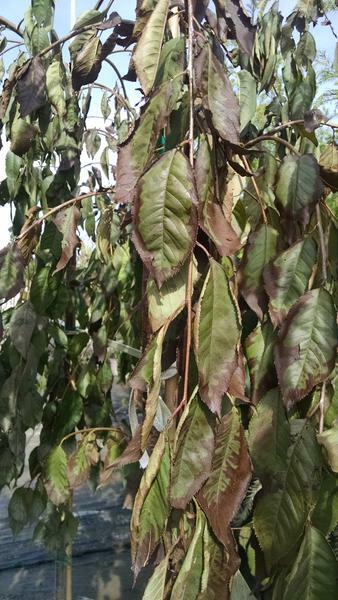 Symptoms include stunting, leaf chlorosis, reduced leaf size, basal stem cankers which often ooze sap, root and collar decay, crown dieback, wilting, and death. Pythium spp. cause damping-off and root rot on young seedlings in nurseries and can infect nearly all conifers and hardwoods. Phytophthora spp. 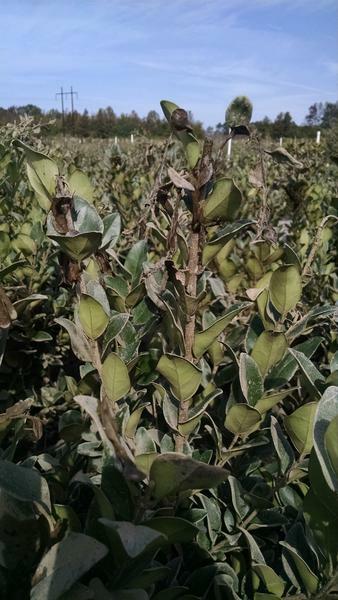 incite root and collar rot diseases, as well as a number of foliar diseases, on a wide range of nursery and forest tree hosts including Rhododendron, Azalea, Kalmia, Abelia, Leucothoe, Viburnum, Pieris, Camellias. Avoiding waterlogged or puddled areas is key to managing these pathogens. Removing plants from waterlogged areas as soon as possible will help limit disease. Additionally, there are several fungicide drenches and sprays available that will help reduce disease. See Relative Effectiveness of Various Chemicals for Disease Control of Ornamental Plants for products. Black Root Rot. This is specific for black root rot on hollies and other hosts.